I spent the holidays with family and friends, and the one subject that came up over and over again (apart from the discussion that we were all eating too much) was about jobs. Some people were looking for jobs, and others were complaining about their current positions. When I asked these people whether they were planning to look for new positions this year, I got a lot of "We'll see" or "YES!" Previously, the only way your employer might get a hint that you were looking for another job was when you showed up in a nice outfit suitable for interviewing during your lunch hour instead of your usual scruffy khaki pants and T-shirt. Or, maybe you were careless enough to leave your resume in the office copier. But these days it's a much different story. Employers may be able to glean that you're looking to jump ship by your frenzied activity updating your LinkedIn profile or through a Twitter or Facebook posting that mentions you hate your job and are trying to leave as quickly as possible. Savvy employers may even use Foursquare to track your movements and see that you've been visiting competitors or spending a lot of time in FedEx Kinko's, where they might surmise you're making copies of your resume. The problem is that with the job market so full of talented people seeking jobs, your boss may tolerate your actions less than in years past. He or she may believe that your desire to leave should be hurried along — and just fire you on the spot. "I think there are a lot of people looking for other jobs these days because they've been working really hard and holding onto jobs for a long time that they don't love," says Hannah Morgan, a career and job-search consultant who writes the Career Sherpa blog. "But I also think you have to be very, very careful if you're going to look for another job when you already have one." Susan Joyce, editor and publisher of Job-Hunt.org, agrees. "People are so clueless," she says. "I don't know how many times I've contacted someone and told them that they need to remove the "Job-Hunt.org" (widget) from their list of LinkedIn groups. Groups are something that are Googled relentlessly by employers." Employers are doing Google searches on their employees and their activities because they are aware of creeping employee disengagement and dissatisfaction. They know such unhappiness can lead to turnover as the job market improves. A Gallup poll found that more than 1 in 4 workers are unhappy with the tangible rewards from their work such as pay and benefits and also cite a higher level of on-the-job stress. Human resources departments and bosses often keep an eye on employees' social media chatter and may do keyword searches to turn up resumes from employees posted to job boards of other company job sites. Using job titles, company names and even industry keywords, employers may be able to find you easily through their searches, Joyce and Morgan say. 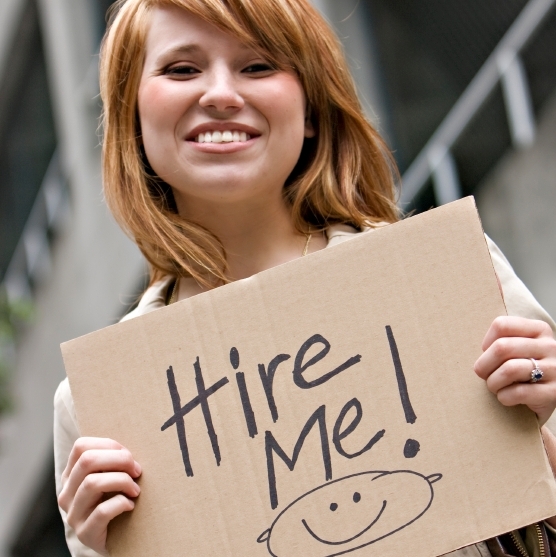 • Don't attend job fairs or job-search networking events. On the other hand, going to an industry conference can be seen as necessary for your current job but still give you plenty of chances to network with other potential employers, Morgan says. "Even when attending these events, don't ask someone whether they've got any openings at their company," she says. "Say something like, 'So, what's new and exciting at your company these days?' It's more subtle, but still raises awareness of who you are." • Never use company time or resources. Don't use company voicemail or email; your employer can check both, and evidence of a search could be immediate grounds for dismissal. Joyce even suggests buying a throw-away cellphone just for your job hunting so no one else can tap into your messages or accuse you of using company property. In addition, access your social networks only through your personal computer and account. Joyce says she knows of one instance where a woman had built up more than 500 contacts through LinkedIn but lost them all when she was dismissed from her job and the account was accessible only from her work email. • Turn off the updates feature. When updating your profile on LinkedIn, for example, turn off the automatic updates feature so your network isn't constantly being pinged that you're suddenly busy on the professional networking site. If you're connected to anyone in your company, it might be a red flag to them that you're looking for another job, Morgan says. • Stay mum. Don't tell anyone, including your best buddy at work, that you're searching for a new job. If asked about it outright, Morgan says you never should openly admit to the search but rather say something like "Aren't we always looking for another job?" and just try to laugh it off. Joyce says to try to be as cagy as possible with your responses and be prepared with a response if your boss asks if you're looking for another job. "It's smart to have a comeback in case you're asked," she says. Any other advice for searching for a job without the boss finding out? While you may know that studies have found multitasking hurts productivity, the truth is you really haven't stopped trying to do more than one thing at a time, have you? After all, while some people may not be able to multitask well, that certainly doesn't include you. Have someone time you while you write the word "multitask" and then the numbers from 1 to 10. Record your time. Have someone time you while you alternately write the letters of "multitask" and the numbers 1-10. For example, you will write "m" then "1" then "u" then "2" and so on. Record your time. After comparing the two times, chances are pretty good you'll no longer think you're a multitasking whiz. Sanjeev Gupta uses the test when he arrives at companies that hire him to improve their productivity. His company, Realization, has worked with employers such as Delta Air Lines and Boeing, boosting project completion by as much as 50 percent. But first, he has to prove to employees that their multitasking is causing more harm than good, so he uses the simple test to make his point. "There are several reasons that people multitask," he says. "One of them is because people want to appear busy. Or, if they get stuck on something, they'll move onto something else instead of completing the task." He says workers also multitask now more than ever because they feel pressured to get more done. They're constantly moving from project to project depending on who is demanding their time at any given moment. The result is that they never complete something before moving on, causing a ripple effect that causes other workers to get off track and miss deadlines. But experts contend that not only is multitasking harmful to your productivity at work, it can affect all areas of your life. An Emory University study earlier this year found that such behavior can sap your ability to control other impulses, causing you to be much more prone to losing your temper or cheating on your diet. Gupta says he believes multitasking continues to grow as a problem in the workplace because of an increasing number of communication channels: The phone, email, instant messaging, Twitter and Facebook can lure away the attention of an employee who should be focused on a completing a task. The employee then jumps back into work, only to be tempted to check Twitter updates or answer emails. The multitasking cycle continues, causing the employee to become less and less productive over time. • Set a disconnect time each day. Try to work up to about two hours every day that you aren't connected to the Internet, your email, phone or instant messaging. Let others know that this is a time you're off the grid. You may need to go somewhere without a connection to truly get away from temptation, or start in 20-minute increments and work your way up. • Break bad habits. If you check your email first thing in the morning, don't open up your browser for a set amount of time and instead use the time to do something else. If you find you break your rule, immediately call and report yourself to a supportive friend or family member. • Break your day into sections. Use a set period to write, another period to answer email and another period to think creatively. Set limits and don't let yourself stray into other territory until time is up. • Cleanse your social networking habit. Start with 20 minutes, then a half day, then two to three days where you don't connect with Twitter, Facebook or any other social-media site. Use the time to read books or long essays that interest you or watch thought-provoking films. I have mixed feelings about performance evaluations. I've yet to talk to an employee or manager who look forward to them. But sometimes it's the only way to get workers and their bosses to sit down and actually discuss what's going on. If ever you wished you had the powers of mind-reading, it might be during your annual performance review. You may think that if you could just figure out what the boss really thought of your performance and what you can do to improve it without all the business jargon and hemming and hawing, you actually might be able to nab that promotion or pay raise. Instead, you're stuck with the boss rambling on and on while you have no clue of what you're supposed to do to improve — or whether he even thinks you need to improve. It's difficult to find anyone among the leadership- or management-expert ranks who believes performance reviews are a good idea, and that includes Joseph Grenny. He calls such appraisals worthless and notes that research shows such feedback only prompts 1 in 5 employees to change behavior. Still, it's not likely that Santa will show up to whisk away performance reviews on his sleigh this year, so how can employees succeed in making such a feedback process pay off for them? Grenny, one of the authors of Crucial Conversations: Tools for Talking When the Stakes Are High, (McGraw-Hill, $18), says one key is understanding that your boss is human. That may mean that he is really rather miserable doing an evaluation because it's difficult to offer criticism. But it also may mean that he doesn't want to be seen as a wimp by not offering tough enough feedback, Grenny says. The bottom line: Most bosses want their people to do better but don't know how to provide the necessary information to help employees achieve the goals. To get around your boss' poor communication, take matters into your own hands with a pre-emptive strike before the formal evaluation, Grenny says. Meet with colleagues and the boss before your formal review and try to ferret out areas where you need improvement. "Ask them (colleagues) how you're doing as a team member. When they give you feedback, ask for facts, not conclusions," he says. "You want concrete examples." That way, you can take corrective action before a review, perhaps lessen the severity of the criticism and show you're taking steps to improve. Don't get defensive when given feedback. Instead, repeat back what you've learned. Grenny suggests saying something like, "So, what you're saying is if I do XYZ, then you'll have a more favorable view of my performance?" He adds that if the boss mentions an improvement that will require his input, further training or education, ask if he can help you with resources. Despite your efforts, you may find that someone is dancing around an issue concerning your performance, or trying to sugarcoat criticism, Grenny says. Even though it may be difficult, you might have to push for honest, critical comments. "You want him to be honest with you about how you can help him," Grenny says. "Make it safe for the boss to disclose what he's really thinking." Once you've gotten critical feedback from the boss, always follow up, Grenny says. "I'd give it two to four weeks, then I would check back in with him on your progress. After that, you can wait another six to eight weeks," he says. "You want at least three scheduled meetings on your calendar for the next year with your boss regarding your progress." Also important: Put your action plan in writing. Not only does this help you remember steps you need to take, but it also keeps the boss focused on what you're doing to succeed, he says. • Finding a mentor. If you need to be a better communicator, ask your boss if he knows someone who might be willing to advise you in this area, or seek out someone you know who excels at such tasks. • Practicing. Break down each skill you need to master into smaller parts and ask for feedback from your mentor or boss as you tackle each challenge. • Replacing disappointment with progress. Maybe you weren't thrilled with your review, but keep your boss informed as you make progress. The excitement of moving toward success will help relieve the sting of criticism from an unfavorable job evaluation. What other tips do you have for improving a performance evaluation? I carry a list in my purse that if lost, would mean the end of my sanity. The list contains all the presents I have bought so far for Christmas, what I have left to buy and all the things I need to do before I take time off for the holidays. If I misplaced that list, I might just have to go straight to the bourbon without the eggnog. Before the recession hit, work during the holiday season often slowed down a bit. The slower pace allowed you to get off work early enough to do some holiday shopping, and weekends could be devoted to spending more time with family or baking instead of working or checking email. But more workers are doing the job of more than one person these days and everyone faces an increasing demand to perform at a high level no matter the time of year. Workers are forever being reminded of how lucky they are to have a job, and stress is growing. In a recent study by CompPsych, two-thirds of employees say their stress levels are high; 29 percent say they come to work too stressed to be effective on five or more days a year, up 10 percentage points from last year. • Just say no. Maybe you've always baked cookies for the office party. Not this year. Stop by a bakery, buy cookies, put them on a plate you've brought from home and you're all set. It's not so much that you're saying no to other people, as much as you are giving yourself permission to say no to yourself and do things differently. • Use positive self-talk. If you get annoyed with co-workers who have had too much to drink at the holiday party or who whine incessantly about their workload, remind yourself that their behavior is just a passing event in your life. Make a list of all the positive things in your life, like a great family, fun friends or the joy of walking your dog. Consult this list every time you start to feel the stress creep over you. • Get out. Remove yourself from surroundings that are getting you down. Whether you're battling crowds in a mall, stuck in a cubicle or working in a home office, change your surroundings when you get stressed. Ducking outside and breathing deeply can help release tension. Even going into a bathroom and washing your hands has been shown to relieve stress. • Tell yourself "even if." For example, even if you have to work late on a project, you will still spend time with people you love over the holidays. Or even if you can't cook the perfect holiday meal, you've got a great take-out menu that will come in handy. • Seek your bliss. Some people love those corny holiday movies, while those classics make others feel depressed because they think their own lives don't measure up. So what if you want to watch old I Love Lucy re-runs instead of It's a Wonderful Life? The things that make you happy are not measured against someone else. They are unique to you, so surround yourself with what makes you happy. • Leave regrets behind. Don't feel bad that you didn't get a co-worker a gift when she brought you a jar of homemade jam. Giving your thanks sincerely is what she's after, not a chance to bring you down. Don't regret the things you haven't done but savor the things you've accomplished. Think about the work you've done this year under difficult circumstances, the things you've done to help out others without being asked. Those accomplishments easily should outweigh any regrets. • Make your body a priority. You may feel that there aren't enough hours in the day to get everything done, and if you just skip a meal or give up a few hours of sleep, you can meet all your demands and obligations. Unfortunately, your body may not go along with your brain's idea. Failing to eat right, exercise and get enough rest is a recipe for sickness and injury. And failing to listen to your body's demands may result in some serious consequences. What others suggestions do you have for coping with the season's demands? There are some days when I think I possibly have the coolest job in the world. Because I'm a journalist, I've attended presidential inaugural balls, I've been with cops as they raid a drug den and I now have interviewed a rapper. For this latest story I did for Gannett/USAToday, I learned that the power of marketing yourself for a job can be learned from college professors -- and from hip-hop artists. Now, does that make my job cool or what? For the past decade, Larry Chiagouris has watched college seniors troop into his office every spring at Pace University in New York, seeking his advice on how to get a job. As a professor he has tried to share his advice throughout their college years, but not until many of his students are preparing to graduate do they start to gear up for a job search. So he repeats much of what he has told these students for years, telling them to market themselves like a product, promoting their unique qualifications to attract employers. Because he was beginning to feel like a broken record repeating the same advice, Chiagouris says he decided to write a book called The Secret to Getting a Job After College (Brand New World Publishing, $14.99). Still, he says he knew from his years of teaching that he needed something else to hammer the message home. "Timid" is the rap name of Jaylon Carter. His videoInferno attracted Chiagouris' attention, because he thought Carter was delivering a message that spoke to the fire-in-the-belly attitude students need to develop if they want to find a job. "The message I had was more than about the book," Chiagouris says. "Young people or anyone has to know their value and be proud of it. No one else is going to know your value unless you market it. And if you can't sell yourself, what can you sell?" Carter was receptive to the idea of helping others to find a job through his music. "I know the mainstream message of rappers and hip-hop artists is not a great one," he says. "But I know from being in the culture that's not completely the case. Not everyone fits that negative image. "I don't think anything since the civil-rights movement has done more for intercultural communications than hip-hop." Carter says he was further attracted to the get-a-job message because he also is a college student. Enrolled at Thomas Edison State College in Trenton, N.J., Carter expects to graduate in February with a degree in communications. He knows firsthand the challenges of the current job market but believes, as Chiagouris does, that young people can't become hopeless and believe they won't be able to get a job. His rap video, also featuring students from Pace University, addresses the difficult economy and job market. "Truth be told you have to be sort of a salesman, with the product of you packaged ready to sell to them on display," Carter raps for a student audience. • Think broadly. Students should list what they're good at and what they like to do. Then they should take that list and apply it to a career direction. "Zone in on a couple of occupations," he says. If you write well or are good at public speaking, don't just think about a job in journalism. Every company needs good writers and people with good verbal skills to persuade others, he says. • Prepare a marketing spin. Chiagouris suggests students complete this sentence: "I'm one of the few graduating seniors who can …"
Maybe you have volunteered consistently, had three internships or have done four or five projects on a particular topic. "Look hard in the mirror at what makes you, you," he says. "Think about how you can position yourself to stand out." • Look at your resume with a fresh eye. "Does your resume scream the things you've just learned about yourself?" Chiagouris asks. He counsels students to think about effective print ads when structuring their resume. "You will rarely see a lot of copy in these ads, but the main points are made," he says. "Less is more on a resume. Don't try to cram in too much. Put in those things that you like and you're good at." • Forget the objective statement. Busy hiring managers don't have time to read — and don't care about — objective statements. Instead, summarize what makes you unique. Go back to the "I'm one of the few graduating seniors who …" he suggests. "You want that statement to be an attention grabber, like a headline." • Be ready. "The phone is going to ring when you least expect it with someone wanting an interview," he says. "Be ready to answer questions like, 'Tell me about yourself' and 'What are you good at?' any time you pick up the phone." Any other suggestions for young job seekers?